The Chief of Air Staff, Air Marshal Sadique Abubakar, has called for alternative sources of funding to enable the armed forces meet training and operational needs. Abubakar made the call in Abuja on Monday while speaking to newsmen after budget defence session with the House of Representatives committee on Air Force. He said that it was necessary to look beyond the budget by seeking fund through alternative sources. “We appreciate the support of the national assembly, but there is need to look beyond the annual budget, the Air Force is a very expensive institution that requires a lot of resources to function. “We are working to ensure that we get what is required in terms of platforms, capabilities and manpower so that we can make Nigeria a more secured country,” he said. “I have said that the air force is expensive to maintain, so we cannot depend on the budget alone, ” he said. He commended the federal government for the support given to the armed forces, saying that such had aided them to go into power protection of the air access. “So this is the reason we have the special forces training that’s going on, very soon, we will have sufficient capacity to be able to support other sister agencies in conducting of limited ground operations,” he said. Abubakar said that alternative funding for the air force could be generated through Public Private Partnership (PPP) arrangements. He said that percentage interests from financial institutions and levies on certain charges on mobile phone users are possible avenues to generate funds. “You have to be safe first before you can think of enjoying your mobile phone, so whatever a subscriber gives to the mobile phone company can have certain percentage deducted to fund the armed forces. “These resources can be pushed to equipment manufacturers and we just get the aircraft, that all we are interested in,” he said. Speaking on the use drone technologies to minimize the cost of flying fighter jets, he reiterated the expensive nature of keeping Unmanned Aerial Vehicles (UAVs) in the air. “They are very expensive, we say they are unmanned, the only difference is that you don’t have anybody inside flying. “But you have about 15 people on ground managing just one UAV, they are very expensive, but we will get there,” he said. Businessman, Mr Bharat Vora, on Monday prayed a Federal High Court in Abuja to award him N2 billion against the Federal Inland Revenue Service (FIRS) for shutting his business. He said the audit, which began in July 2013, led to the closure of his business in 2016 over payment of taxws on monies he never earned. The suspended Chief Justice of Nigeria (CJN), Justice Walter Onnoghen, has opened his defence in the ongoing trial for alleged questionable assets declaration. The suit was filed against Onnoghen by the Federal Government at the Code of Conduct Tribunal (CCT). At the resumed sitting of the case in Abuja on Monday, a witness, Lawal Olarewaju-Busari, told the tribunal that he was Onnoghen’s driver from 1999 to date. Umar also told the tribunal that there was no proper foundation backing the witness to tender the document and that the receipt (document) has no revenue number, and was supposed to be provided by the Cashier instead of the witness. “There is no provision in the evidence act to what the prosecution is saying, admissibility is regulated only by the law and no other form, the witness has given enough evidence to make the document admissible,’’ Awomolo said. Umar, which earlier took arguments of parties, held that Onnoghen had case to answer and should enter his defence. Three police officers have been taken into custody in connection with the fatal shooting of a young man in Lagos on Sunday. The victim, Kolade Johnson, was watching a live football match in his Mangoro neighbourhood on Sunday evening when a patrol vehicle of police anti-cultism unit pulled over to arrest someone in the area. According to witnesses, the police suspected the man was a criminal because he was wearing dreadlocks. It was later learnt that the team carried out at least 12 indiscriminate arrest of young men with curly hair and dreadlocks on Sunday evening. A riot broke out near the scene of the incident on Sunday evening, and the outrage quickly spread online where Mr Johnson’s killing has remained the major topic of social media engagement ever since. A top police source said three officers have now been arrested on the directive of police inspector-general, Mohammed Adamu. “Three police officers have been arrested now in Lagos for the trouble they have caused the man’s family and Nigeria as a whole,” the police official said under strict anonymity because the police were still measuring how to control the message. “An orderly room trial will be conducted against the officers, and, if found guilty, they will be summarily discharged from the police and charged to court for murder,” the officer said. The police chief said it was possible officers involved in the controversial raid might be more than three. “We have learnt at the Force Headquarters that the officers might be more than three, and we have given the police commissioner in Lagos a strict instruction to make sure that all those involved are identified, and punished, no matter their ranks,” the officer added. A senior aide to the general overseer of the Redeemed Christian Church of God, Enoch Adeboye, has died. The aide, Adetokunbo Olorunnimbe, who was the Chief-of-Staff and Chief Private Secretary to Mr Adeboye. died on Saturday at the age of 60 years. His death was confirmed by Olaolu Olorunnimbe, who also revealed that burial arrangements will be announced soon. The deceased was born on May 26, 1958 to Ishola Adekunle Olorunnimbe and late Simisola Adetoun Olorunnimbe. He got married to the “love of his life” Modupe Olorunnimbe nee Botu in April 1987. The son of the late pastor, Olaolu, described his father as humble and a man of faith. “He served as the pastor of several parishes and was pastor of RCCG City of Palms. As Private Secretary to the General Overseer, he was a highly trusted and respected member of the church. He never wanted praise for any of his labour of love, but always saw his service to the church, to the community, and to his family as a way of sharing his love for God. The late Tokunbo Olorunnimbe is survived by his wife, Modupe Olorunnimbe, their children: Folasayo Williams, Laolu Olorunnimbe and son in law Bode Williams. His legacy of love and life lives on in his surviving grandchildren: Olasheni and Oluwateniola Williams. Bankole Wellington, Nigerian music star better known as Banky W, has written an open letter to President Muhammadu Buhari on the death of Kayode Johnson. Men of the anti-cultism unit of the Lagos state police command had shot Johnson dead in the Mangoro/Onipetesi area of Lagos on Sunday evening. He was killed after leaving a football viewing center where he watched English Premier League match between Liverpool and Tottenham. In an open letter on Monday, Banky W said the deceased was the only son of his mother, who is a widow. The musician called on the government to act and make sure that those behind the incident do not go unpunished. Dear Sirs, Kolade Johnson, an innocent young citizen of Nigeria is dead. He was the only son of a widow, a husband and father,” he wrote. His only crime was being in the right place at the wrong time… watching a football match when SARS operatives who allegedly came to arrest someone, started shooting sporadically. Kolade is not the first innocent victim of reckless behaviour by SARS operatives, and he will almost certainly not be the last. It is sickening, frustrating, and unfair. We are tired of hearing about victims of police brutality, but never hearing about the criminal, reckless police officers being brought to justice. We are tired of screaming and tweeting #ENDSARS while our innocent young people are being extorted, bullied, maimed and killed by the very same officers who are meant to protect them. And we are tired of our leaders remaining silent, incident after incident. The killing had sparked outrage in the area as angry youth lit bonfires on both lanes of the Lagos-Abeokuta expressway, leaving many road users stranded for hours. Social media users are still tweeting about the incident, calling on the authorities to act. President Muhammadu Buhari has directed that the State House Medical Centre (SHMC) should revert to serving its original purpose, according to Jalal Arabi, state house permanent secretary. Arabi said this on Monday when he appeared before the senate committee on federal character and inter-governmental affairs during a 2019 budget defence session in Abuja. He said the facility was initially meant to serve only the first and second families as well as Aso Villa staff. The presidency official added that while the directive was a case of ‘‘cutting one’s coat according to your cloth”, it will also make the medical centre functional. “Without prejudice to what is currently obtainable at SHMC, the intention to revert to a clinic is a presidential directive,” he said. “This is to make sure that the facility is functional and serves the purpose for which it was established, ab initio. It was initially meant to serve the first and second families and those working within and around the Villa. Arabi also said the centre had a total budget of N1.03 billion in the 2018 budget, with N698 million as capital expenditure and N331.7 million as overhead cost. He said while the allocation for overhead cost was fully released, only N231.9 million was released for capital expenditure. TheCable had reported that the clinic lacks basic medical equipment and drugs such as syringe, paracetamol, cotton wool. Aisha, wife of President Muhammadu Buhari, had also lamented the poor state of the facility. The house of representatives subsequently passed a resolution to set up a committee which will probe how the N10.9 billion said to have been released to the clinic from 2015 to 2017, was spent. Five men have been arrested in connection with a daring armed robbery at a money exchange house in Sharjah, police said on Sunday. The suspects, all Nigerian and aged in their 20s, stole currency worth over Dh2 million (N226m) during a seven-minute heist at the Al Tauwain branch of Al Ansari Exchange close to midnight on March 20. 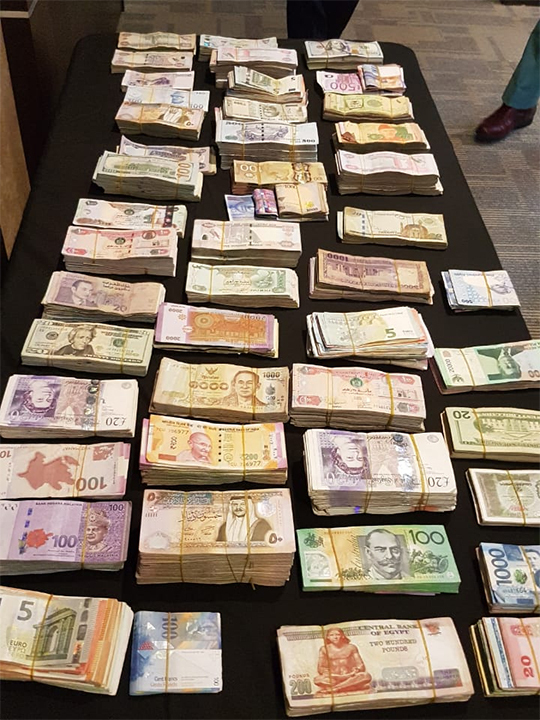 The police said they have recovered foreign and Arab currency worth Dh2.3 million from the suspects. Major General Al Shamsi said by the time the police were informed about the incident, the suspects had escaped. The employees failed to activate the alarm to alert the police. The alarm went off four minutes after the raid, which gave the suspects a chance to escape, he noted. However, the Sharjah Police managed to catch up with them. Thanks to surveillance camera footage, they were able to identify the faces. The gang had travelled in a used car which led the police to the first suspect within 48 hours of the crime. As it turned out, the gang members had spread themselves out in other emirates after the robbery to escape notice and had planned to communicate with each other through their Facebook accounts. But Major General Al Shamsi said the police, which had formed a special team, traced their whereabouts and raided their hideouts in Sharjah, Ajman, Ras Al Khaimah and Abu Dhabi. All the suspects were arrested with the help of the police forces in these emirates. During the raids, the police recovered the stolen money, besides sharp weapons. Sharjah Police warned bank and exchange owners to be alert while transporting cash. According to police, three of the suspects had resident visas while two of them were on a visit visa. The head of the gang had entered the UAE just two days before the robbery. All the five, who have confessed to the crime, said they intended to leave the country. Fifteen Nigerians, including four women, were arrested for illegal stay during the search operations. The case has been referred to the public prosecution for further action. The issue of visit visas without due diligence has now come into sharp focus. 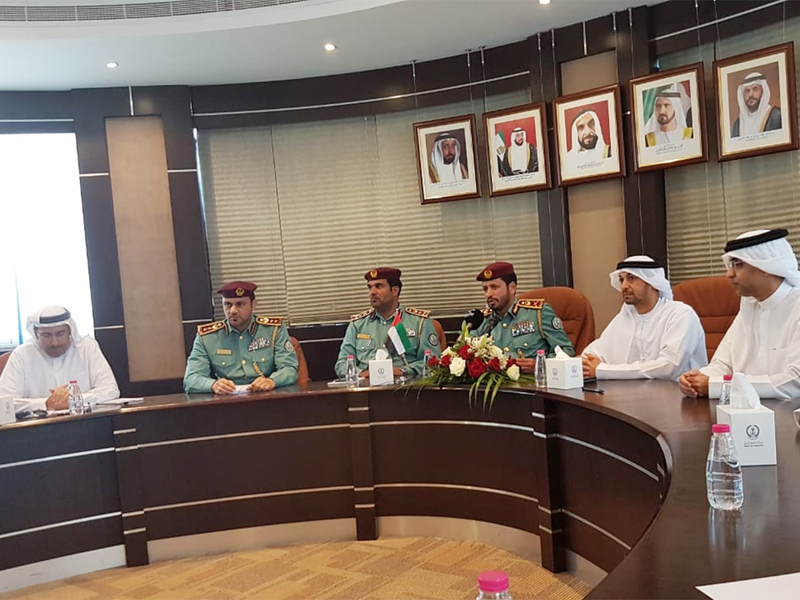 Just last week, Sharjah Police discussed with the concerned authorities mechanisms to prevent the misuse of visas. During the 2019 Economic Sustainability Forum, it was pointed out that many visitors enter the UAE as businessman but take to begging, while some others commit thefts. Rashid Al Ansari, General Manager of Al Ansari Exchange Company, who was also present at the press conference, said the gang members attacked employees of the money exchange who were sitting behind a glass panel. The suspects smashed the panel with hammers and jumped inside the counter where the money safe box was kept. Two of the exchange staff sustained minor injuries while resisting the suspects. Although the exchange had closed at 11.30pm, the employees were catering to one customer which was why the main door remained open, giving the suspects easy access. The Al Tauwain branch is one of Al Ansari’s 185 exchanges in the UAE, including 30 in Sharjah, Al Ansari added.